Fractal Design Dynamic X2 GP14 is true all-purpose fan, offering good airflow and optimal MTBF thanks to the improved LLS bearing. 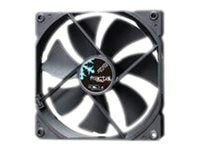 Its customized design creates a beautifully aesthetic fan to help keep your system cool, yet quiet. The Dynamic X2 fan features aerodynamic elements, similarly found in airplane wing designs, with significant noise-reducing elements.